Pardon me while I load a ridiculously oversize image, but trust me, she's worth it. Yes, indeed, the gorgeous girl who greets you when you first come to my web site (you missed her?! go there now!) is my all-time favorite anime character. Ayukawa Madoka, of Kimagure Orange Road. Extremely bright, multi-talented, beautiful, and unpredictable (what good would a Holy Grail be without some danger? ), she's a dream girl. Which is probably why she exists only on paper, but we can fantasize, huh? And make believe there really is a girl like her somewhere? At least, that's my excuse for why I keep looking at her. Oh, so you'd like to see some more pictures of her? Well, here's a few I keep in my wallet, just click here. If those don't satisfy your appetite, links to more are included on the afore-mentioned picture page. Since research has shown conclusively (TV episode #42, OVA #2) that Madoka is irresistable to both guys and gals, these pictures and links should be of interest to members of both genders. The Operations Director at NERV, the ultra-secret organization which developed, built, and operates the Evangelions. 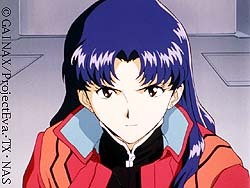 She oversees all day-to-day operations at NERV HQ, and commands the Evangelion sorties against the Angels. She's all business at work, but when off-duty is a completely different person. She's bubbly, irreverent, insecure, and just plain wacky. Her apartment looks like an earthquake hit it, her diet consists of beer and TV dinners and beer. Except in the morning, when for breakfast she has beer and noodles and beer. After her first beer in the morning she loudly proclaims that this is the right way to start the day. After her first beer in the evening she loudly proclaims that this is the moment she worked all day for. One of the three Priestesses of El Hazard. The three together provide the only force in El Hazard which can unseal the Eye of God (although the two princesses are the only ones who can operate it). Shayla's sorcery specialty is fire. She is violent and foul-mouthed, and prone to fits of extreme temper, in other words every guy's worst nightmare, which is why I like her so much. Also she has a fondness for sake, another plus. She is enraged upon her first meeting with Makoto, when she finds out (in the women's bath) that he is a boy impersonating the kidnapped princess Fatora. But rather quickly she forgets about that when she falls for him. Meanwhile, Alielle, pining for her missing Fatora, falls for Shayla. The El Hazard saga just gets nuttier from that point on.